One of the signs of summer is the appearance of butterflies in the garden. 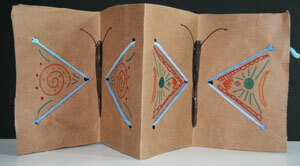 This month's project is an accordion book which uses yarn threaded through holes to create two butterfly shapes. The wings can be filled in with symmetrical patterns. I have particularly fallen in love with butterflies as images since our trip to Korea where butterflies are symbols of happiness. Thread the other piece of yarn through the bottom hole. 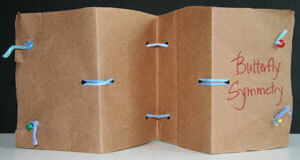 Bring both pieces of yarn into the single hole on the same page. Turn the accordion over (it will look like an M from the side) and thread both pieces of yarn through the center hole on the next page. Turn the accordion over (a W again) and thread each piece of yarn through one of the two holes (top and bottom) on the same page. Turn the accordion over and repeat the process to make the second butterfly. Tie a bead to the end of each piece of yarn close to the accordion. Create a garden that attracts butterflies with guidance from these two websites. A butterfly image created in Photoshop and inspired by my trip to Korea can be seen on my art blog, in good spirit.